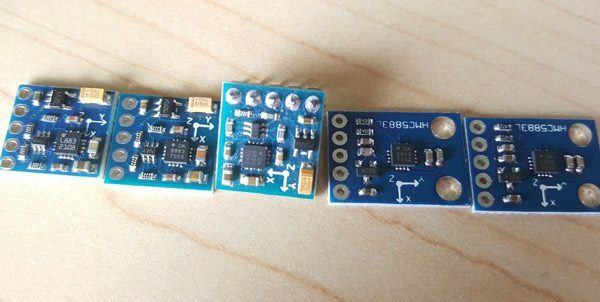 Last week we struggled with mislabeled and faulty breakout boards from Taobao. Fortunately purchases from Shenzhen sellers usually arrive the next day, so we’ve already got a bunch of replacement boards to test. Last week our HMC5883L breakout turned out to have a non-compatible QMC5883 chip. We need the genuine part to do a demo so we purchased four more from different suppliers. Each supplier confirmed that the breakout has an original HMC5883L, not the guochan (locally produced) QMC5883. 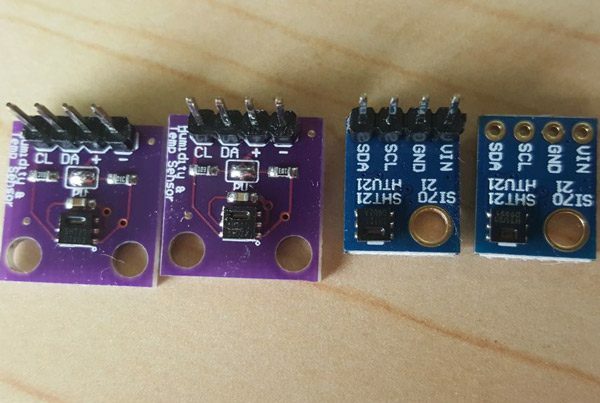 Of the four boards, only one has a genuine HMC5883L. The only seller with the original part actually offered the option of a guochan version for around 10RMB, or the original for around 40RMB. All the other breakouts came with a QMC5883 and cost around 10-15RMB. There are dozens of listings for this breakout on Taobao for around 10RMB, it’s safe to assume they’re all actually using a QMC5883. One of the sellers of the QMC5883 boards strenuously argued that the part was real and drew a helpful circle on our photo pointing out the model number. We countered with a photo of the chip markings compared to an original. At this point someone higher in the support chain, probably the boss, confirmed that “everyone” switched to the cheaper Chinese chip a year ago, and that buyers all know this. Now we know too. First, a correction from last week. We made a pretty basic mistake reading the SHT21 datasheet. The measurement resolution control of the configuration register is split into bits 7 and 0, not 7 and 6. After recognizing this the default value 0x3A is realistic. Read correctly, bit 6 (0) correctly shows VDD > 2.25volts, the heater is disabled (bit 2=0), and OTP Reload is disabled (bit 1=1). Embarrassing, but an encouraging sign things are looking up. That leaves the issue of the impossibly high and definitely incorrect humidity measurement. We purchased a replacement SHT21 from Youxin, the original vendor, and samples from two other Taobao sellers. All three breakouts work as expected, but on closer examination the board on the far right is actually an HTU21, not a Sensirion SHT21. HTU21 is a drop in replacement for the SHT21, but much cheaper. An Sensirion original is around 30RMB ($5), while the HTU21 is just 10RMB (~$1.50). The seller marked it as an SHT21 original and charged the market rate for an original (~35RMB). An extraordinarily low price consistently means non-original parts, but unfortunately a reasonable market price isn’t a reliable indicator of genuine parts. The confusion probably starts with first line support reps that don’t know what they’re selling. If it says HMC5883, it must be HMC5883, right? Another part is being an informed consumer. If the original goes for 40RMB, the 12RMB version is going to be a substitute. This is obvious now, but the sheer volume of mislabeled listings makes it really hard to get a handle on a reasonable market price. Taobao offers a huge selection of inexpensive parts, and next day delivery is usually around $1. That’s really amazing! However, getting multiples of everything to ensure at least one is genuine probably costs more than buying from a western-facing supplier like Seeed Studio, SparkFun or Adafruit. This entry was posted on Tuesday, April 24th, 2018 at 5:21 am	and is filed under Shenzhen. You can follow any responses to this entry through the RSS 2.0 feed. You can skip to the end and leave a response. Pinging is currently not allowed. I have certainly noticed certain suppliers (like Adafruit, Pololu) being… “western-facing” – which is another way to say their prices definitely aren’t Eastern Europe compatible, in spite of the obvious fondness of their wares some of our local merchants seem to exhibit recently. Well, not compared to the low-cost alternatives anyway, many of which are fortuitously also available locally; thankfully I’ve never been in a position of having to procure guaranteed-original parts like this, but I can appreciate the difficulties involved.